The battle between the Operating Systems is very common these days. Why? because there are different operating systems that offer a different set of advantages and disadvantages. But the worst part is choosing between them is becoming harder now. macOS, Windows or Linux? So to make it easy for you, in this article, we are providing you with everything you need to know which one is better for you. So stay tuned for that. The operating system acts as an interface between the user and the computer hardware. In simple words, a user with the help of operating system manipulates the C.P.U (Central Processing Unit) to get the desired task done. For example – You want to browse the internet while listening to songs. How will you do it? and What you will need for that?. First of all, you need a Web browser and a media player installed on your computer and by this, we mean a platform where both of the software applications are installed, so to make them work simultaneously. Here the word platform refers to Operating System. Though there are many operating systems. But here we will only be talking about the most popular ones. 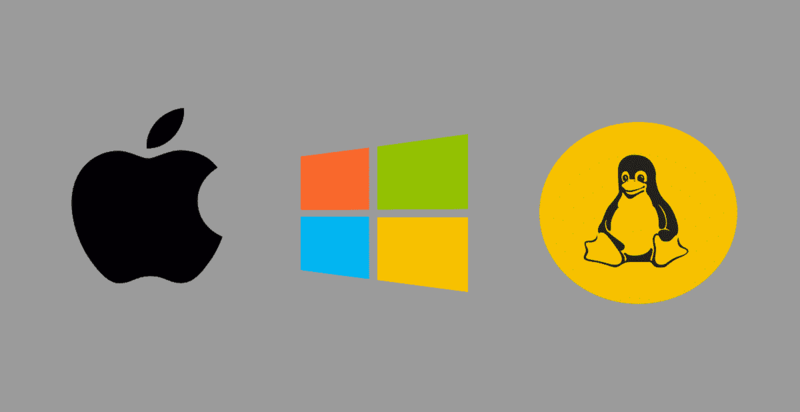 These are the top 3 most popular Operating Systems in the world. Mac Os – Mac Os is the operating system by Apple for their exclusive iMac and MacBook lineup. It’s a very sophisticated operating system with superior performance and stability. Windows – Windows is the most popular and widely used operating system on the planet. It was introduced by Microsoft with the purpose of dominating personal computing at that time. Linux – Linux is the free and open-source operating system built across the Linux kernel. It’s a very powerful OS which offers great control and command over the device (CPU). Simple and Powerful user interface – Mac OS has the simplest and most powerful user interface among all. No, we are not being biased here, it’s true. If you compare both of them side by side you will notice that the icons on a mac are much more organized. In fact, installing and launching apps on Mac OS is as similar as iOS. So if you already own an iPhone then it will be easier for you to learn and operate Mac OS. Fewer Virus attacks – One of the biggest advantages of Mac OS over windows is that it suffers from very fewer virus attacks. Now, it doesn’t mean that Mac OS is more secure than windows. But the reality is due to the widely used banner of windows, hackers target it more frequently. This somehow benefits the Mac user as nobody is making virus prone software for Mac. World class Integration between hardware and software – This might be the biggest reason why people prefer Macbook or iMac than any other computing device. Apple is known for its full control over the devices, as the design of the hardware is prepared by Apple itself. So, this allows them to create fully optimized apps as the developers have the access to the hardware of the device. Thus, as a result, the software performs smoother and Apple keeps it working smoothly for a long time. Integration of Apple Products – Have you ever heard about “Ecosystem”?. Many people believe that Apple has one of the most beautiful ecosystems when it comes to the integration of devices. Yes, we are talking about the integration of Apple watch with iPhone and MacBook. Apple really worked hard in making things work like new for quite a couple of years. Expensive – When it comes to breaking the bank then Apple has a very major role in it. It’s on record that Apple sells one of the most expensive gadgets in the world. This is more noticeable when comparing the price point of Mac computers with their Windows counterpart. So keep this in mind. Harder to upgrade – Macbooks and iMac’s are very hard to upgrade. Now, some of you must be thinking how?. Well, most of its hardware components are integrated both at a design and engineering levels. So, this makes it even harder to upgrade. No Games – Yes, this might make you sad but it’s a reality. Macbook’s and iMac’s are not meant for gaming. So if you want to buy a laptop or pc just to play games then we recommend you to go for windows. Cheap – Yes, the biggest advantage of Windows is that it’s pretty cheap. You need not to break the bank for Windows PC or Laptop. This is because Microsoft sells the Windows copyright license to every PC or laptop manufacturer in the world. For example HP, Dell, and Asus etc. Variety Options – By the above-mentioned point, you can very much figure out now that the options for windows laptop and PC are very huge as compared with Mac OS. One more thing to keep in mind is that you have a variety of options depending on your budget also. Software availability – Since there are more windows users across the globe, there are more software programs, games, and utilities for windows operating system. Customizable – You can customize your Windows operating system to another level. This is something which is missing in Mac OS. Games – Many people who can even afford to buy iMac or MacBook refuses it because they prefer playing games on PC and laptop. This is probably the biggest advantage of Windows OS and a disadvantage for Mac OS. Upgradable – Unlike Mac operating System windows allow you to upgrade the hardware with an ease. For instance, if you want to upgrade your Processor, ram or SSD then you can do it. This is because Windows is not limited to Microsoft’s Laptops or Pcs. Malware and Virus Attacks – In this case, the biggest strength of Windows become the biggest weakness also. The popularity of windows allows hackers to create virus and malware powered software which damage the operating system to great extent. Every year more than millions of Windows devices get affected. Less Reliable – Similar like the above-mentioned point this makes windows operating system less reliable. Becomes Laggy overtime – Yes, it’s true. It has been observed that with every Microsoft update windows tend to become laggier. People on Social Media also makes jokes on it. So this is something where Microsoft needs to work soon. Low cost – You need not to spend any money to obtain its license, because its software comes from GNU General Public License. You can also download the high-quality software for Linux and that too from wherever you want from, free of cost and you need not to worry that your program may stop due to the trial version. You can also install it on many computers without even paying. Stability: Linux is stable enough to get your daily tasks done. You don’t have to reboot it periodically. It can also handle a large number of users and does not hang up or slow down due to memory issues. Flexibility: It is used for high-performance applications, desktop applications, and also embedded applications. You can even save disk space by installing components required for a particular use. Choice: Choice is one of the greatest advantages of Linux. It gives the power to control every aspect of the operating system. Main features that you can control look and feel of the desktop by Windows Manager and kernel. Understanding: To become familiar with Linux you need to have a lot of patience and desire to read and explore about it. So keep this in mind. Software: Linux has a limited selection of available software. Ease: Even though Linux has improved a lot in ease of use but windows are much easier. Hardware: Linux doesn’t support many hardware devices. So this was all regarding the comparison of Mac OS, Windows, and Linux. In our conclusion, we found that every operating system has its own advantages which in some cases might be a disadvantage for another one. Good reading. However, I don’t agree on the cons for Linux because my mother is using Linux Mint sins 2014 and she is not very good with computers. But on this 4 years, I have only made one support errant when Spotify stopped working. While when she was using Windows I hade to make support once a month. Hardware support for Linux far exceeds the hardware support for Windows but perhaps not for the “gaming” hardware that most users are commonly using. i.e Windows barely works for ARM and RISC V processors while the Linux kernel had support for those architectures for a long time. Software absolutely agrees with you the selection of software can be limited. The most lacking right now is CAD and graphics. GNU/Linux isn’t for everyone but the group that could be served with GNU/Linux is growing rapidly.